Maharishi Bhrigu was a Manas Putra (born from a wish). It so happened that when Lord Brahma was thinking of making this universe he faced some problems for which he requested maharishi Bhrigu ji to help him out.Maharishi bhrigu is also called ‘Prajapati’ (Creator) as he was created by lord Brahma to help him in the process of creation of the universe . 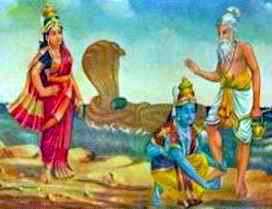 Maharishi Bhrigu ji was married to Khyati ,the daughter of Daksha. He had two sons, Dhata and Vidhata and a daughter shri also known as Lakshmi. He had one more son, who is better known than Maharishi Bhrigu ji himself –Shukra. The sage chyavana is also said to be his son. It is well known that destiny plays role in the formation or birth of remarkable things. It so happened that when thousands of years ago this world was created then after four years all the supreme powers saw that the human kind was in deep pain and problems so they decided to perform a Yagya (A religious ceremony) for the well being of humanity. Just then Narad ji raised a question asking that who will be the head of this Yagya. All the Rishi Munie’s were astonished at the question raised by Narad ji and thought he had a very valid question to be answerd. Maharishi Bhrigu ji told him that the creator of this world can only lead us but then again Narad ji replied that out of the three Brahma, Vishnu and Mahesh only can lead not all and very cleverly gave the duty to Maharishi Bhrigu ji to find it out by himself. Maharishi Bhrigu ji accepted the task and asked the munies to give him sometime to resolves this matter. Maharishi Bhrigu ji firstly went to Lord Brahma in the disguise of a Brahman. When he reached there to see Brahma ji busy in writing Vedas and did not pay any attention to him. He felt insulted and out of his shear instincts he cursed Lord Brahma that he will not be worshiped in this world as when he cannot see a person standing at his door how will he see the problems of the human kind and resolve them. He also told Brahma ji that he was no good to be a part of the creator of the world. At this Brahma ji realized that what a blunder he had committed and folded his hands in front of Maharishi Bhrigu ji and asked him to forgive him for his ignorance and also to set him free from the curse as he is one of the creators of the world and without him this world will be zero. On this Maharishi Bhrigu ji felt that he was little harsh with Brahma ji but the curse could not be taken back so he gave him relaxation by telling him that you will only be worshiped at one place in this world that would be Pushkar. Then Maharishi Bhrigu ji went towards Lord Shiva . When he reached Shivloak he saw Shivgan(bodyguard) standing on the door of the shivloak. Maharishi Bhrigu ji requested them that he wanted to see the Lord Shiva as he had some urgent piece of work but the shivgan flatly refused on which Maharishi Bhrigu ji felt insulted but requested them again to atleast give him the message on which shivgan got angry and pulled out there weapons to attack on Maharishi Bhrigu ji. At this Maharishi Bhrigu ji got annoyed and gave Shiv the curse that in kalyug no one will ever worship you in this world. After this Lord shiv saw for what had happened with Maharishi Bhrigu ji and went after him to feel sorry . But it was too late , Maharishi Bhrigu ji had already cursed him and the curse’s cannot be taken back but there is always room for some alteration . Then Maharishi Bhrigu ji told him that curse cannot be taken back and told him that in kalyug he would be worshiped in the form of ling . that is why we all worship shivling in the temple and not his Murti. Cont....... It is said that among the three only lord Vishnu was able to impress Maharishi Bhrigu ji. The story goes like this . when Maharishi Bhrigu ji entered the place where Lord Sri Vishnu was sleeping with goddess lakshmi at his feet, Maharishi Bhrigu ji became full of anger because he thought that lord Vishnu was not really sleeping but only pretending to sleep just to insult him. This was the time, when the Maharishi Bhrigu ji with his right leg kicked the chest of lord Sri Vishnu. When he was hit lord Vishnu opened his eyes and stood up. Lord Vishnu was astonished to see Maharishi Bhrigu ji standing there. So he bended down his head folded his hands, and said to Maharishi Bhrigu ji, ”My Lord, My chest is the strongest thing in the world, like a mountain, but your feet are so soft. May be you got hurt while kicking me. So please forgive me for that.” While listening to the words of Lord Vishnu Maharishi Bhrigu ji declared him the greatest. But goddess Lakshmi, wife of Lord Vishnu, perceived it an insult of her husband. She gave a curse to Maharishi Bhrigu ji that he and his community (Brahmins) to which he represent will be parted away from wealth. After apologizing from goddess too, she suggested him to write Bhrigu Samhita which would contain predictions of past, present & future of people the Granth would enable to Brahmins to earn their livelihood through the reading done.